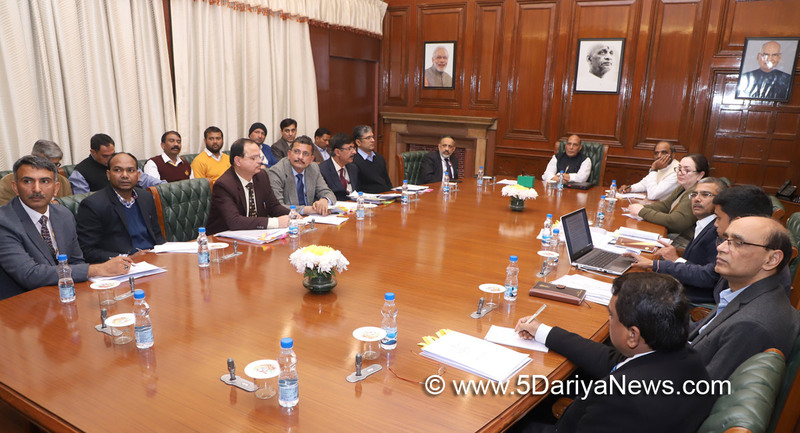 The Union Home Minister Rajnath Singh chaired a review meeting of Internal Security (II) Division of MHA here today. Minister of State for Home Affairs, Hansraj Gangaram Ahir, Union Home Secretary Shri Rajiv Gauba, Special Secretary (IS), Smt. Rina Mitra, Director General of Narcotics Control Bureau (NCB), Shri Abhay and Senior Officers of MHA and NCB attended the meeting.The Ministry of Home Affairs (MHA) has further liberalised the Arms Rules to boost “Make in India” manufacturing policy of the Government as also to promote employment generation in the field of manufacturing of arms and ammunition. A notification in this regard has been issued on 27th October, 2017 by MHA. Life time validity of manufacturing licence.Single licence for multiple units.Provision of direct sale of arms/ ammunition to Central/ State Governments by the manufacturers without permission of MHA.Enhancement of capacity upto 15% of the licenced capacity with intimation to MHA.Rationalization of licence fees, maximum licence fee being Rs.50,000/- only.The Union Home Minister stressed the need of further strengthening of the Narcotics Control Bureau (NCB) and its field formations. He stressed on creation of forensic capabilities, forfeiture of proceeds of crimes and capacity building of investigators.NDAL-ALIS was started on 22.07.2016. The objective of NDAL-ALIS is to facilitate applicants to apply online for arms licences and other services and time bound delivery of services by licencing authorities. The efforts in this direction are in advanced stage.The efforts made by MHA in coordination with Ministry of External Affairs resulted in extradition of Mohammed Sultan Abubakar Kadir @ Captain Kadir from Singapore.